NILES, OH - The Scrappers and Chemical Bank present the twentieth annual "Trick or Treat" at Eastwood Field, with media partners 21 WFMJ & WBCB. The event will take place on Tuesday, October 23rd from 6:00pm to 8:00pm. 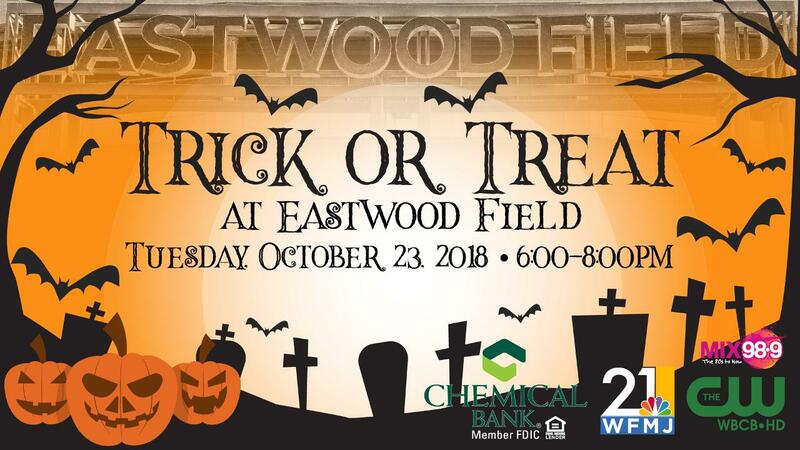 "Trick or Treat" at Eastwood Field is a fun and safe way to celebrate Halloween for children age 12 and under. Ticket quantities are limited and are available on a first come first serve basis. Children and adults will require a ticket. Tickets are just $1 each and are on sale now at the Scrappers Team Office located at Eastwood Field. In addition, anyone that donates canned goods at the "Trick or Treat" event for Project Feed Our Valley will receive a free general admission Scrappers ticket valid during the 2019 season. The Scrappers are looking for area businesses to participate in this year's "Trick or Treat" event. Businesses will receive table space at Eastwood Field. This is a community event and a great way to promote your business to the public. Early reservations are encouraged as space is limited. Please contact Kate Walsh for complete details by calling 330-505-000 or emailing kwalsh@mvscrappers.com. To stay up to date with the Scrappers in the offseason or for more information on 2019 ticket packages, visit mvscrappers.com or contact the front office at 330-505-0000.